Fodder cut and ready for transporting in northern India (photo credit: ILRI/Susan MacMillan). In 2012, a group of researchers at the International Livestock Research Institute (ILRI) worked with partners at the World Bank, under the direction of Jimmy Smith, then a senior livestock advisor at the Bank and now director general of ILRI, in identifying investment opportunities for ruminant livestock feeding in developing countries. Excerpts from the executive summary follow. ‘Driven by population growth, increasing demand, stricter quality and safety standards for animal source food and increasing competition for land and water resources, the livestock sector is changing rapidly. Within this changing landscape, smallholders with crops and livestock will remain the mainstay of the sector in developing countries for some decades to come. For example, the projections in this report foresee an increase in cattle, sheep and goat populations in the mixed crop-livestock systems in the developing world from 467 million to 648 million adult cattle equivalents. However, also here, the abovementioned mega-trends and the resulting competition for feed resources imply that these systems will have to intensify to ensure an acceptable livelihood for its producers. ‘Enhancing the quality and quantity of feed, as one of the most important factors of animal production will play a critical role in this process of intensification. However, feed improvement should not be seen in isolation, but rather be assessed as part of the greater value chain, including all stakeholders. For example, investing in feed improvement without markets to sell the increased production from this investment or without an adequate feed quality control regulatory framework, would yield negative returns. This report follows a step-by-step analytical framework that will provide the priority investments and actions in technologies, policies, and institutions. because of the number of poor involved (110 million) and new domestic market opportunities. such as straws and stovers, although at a projected between 20 and 50 percent these remain a substantial part of the daily ration of the livestock of those systems. (such as oil cakes and by-products of the milling industry) and concentrates, although staying in 2030 mostly below ten percent, with the exception of the South Asian dairy systems, where they would amount to 25 percent of the total diet. With such a low share of the diet, and with most products not edible for humans, these systems would not endanger global food security. in particular in dairy systems; and (d) a sharp increase in feed procurement from the market instead of supply from the own farm. ‘Based on these projections to 2030, opportunities for feed-related investments with major positive impacts on the poor are then identified. A number of strategies, policies, technologies, and services come to light as especially promising areas for such investment in a variety of scenarios. Applying the assessment framework to each of the three value chains yielded similar results for all chains. First of all, they stress that addressing feed related issues in the context of evolving value chains requires combinations of public and private investments: policies, strategies that facilitate adoption and market engagement with reduced transactions costs such as improved access to knowledge and services for smallholder producers and other market agents together with adoption of improved feed technologies. (c) forage seed production. . .
Institutional issues include access to land and water for all smallholders, as a primary concern and as the main incentive to improve crop-residues. Effective governance on feed quality is also a common institutional issue raised. Similarly, reduction on transaction costs (both to access the feeds and to participate in product markets) is another key area for institutional investment support. In all value chains, the report strongly advocates support to Business Development Services – interpreted in the broadest sense as a key to facilitating access to feeds, markets and for reducing transaction costs. . . . The policy concerns are more value chain specific, and include the protection against dumping of meat and milk from the OECD countries, reduction of regional tariff barriers (in particular in Sub-Saharan Africa) and lack of investment in infrastructure. ‘While for many households increasing animal numbers is perceived as attractive, there are severe environmental limitations of the extent this is possible. Policies and investment that increase per animal productivity, such as adequate ration formulation and emphasis on mineral supplementation in the feed and nutrition domain, as well as genetic and health improvement related investment will be important. However, in some areas, increased efficiency (producing the same with fewer animals, or more with the same number of animals) can also be achieved through incentive systems such as payment for environmental services. ‘Ranking those investments regarding their economic return constitutes the final step in the analytical framework, underpinning this study. The analysis shows that for an individual household, the increase in animal numbers is the most attractive option, as has also been proven in the past. Indeed, according to FAOSTAT (2010) data, most (57 percent over the period 1990–2010) of the increased production in Sub-Saharan Africa comes from an increase in animals, and not from increased productivity per animals. This is obviously not sustainable. ‘The key challenge therefore is to increase the profitability of raising productivity per animal. As better feed utilization will be a critical factor in enhancing the profitability and hence in ensuring the long term sustainability of these system, it is therefore encouraging that in most evaluations feed improvements (and in particular the use of crop-residues) rank from the third to the fifth place. The analytical framework also provides a ranking of the importance of timing over the 2010–2030 period in which investments are made. The results show that in general a fast trajectory (i.e. transformation early in the 20-year interval) is associated with relatively higher returns accruing to investments in selected feed types, compared to a “slow” trajectory. Fast action is therefore recommended. ‘The results of this study demonstrate that the assessment framework developed could be applied readily in other systems, and at the same time provides a basis that can be further built upon. Read the report: Identifying investment opportunities for ruminant livestock feeding in developing countries, World Bank, 2012. CGIAR, the world’s leading international agricultural-research-for-development organization, has just done something really useful. 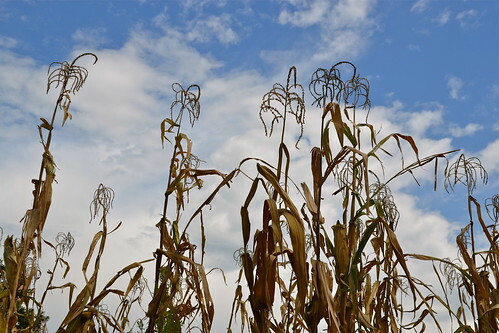 It has published a snapshot of how climate change is likely to affect key food crops and livestock farming and natural resources in poor countries, where these staple foods and resources remain the backbone not only of food security but also of national economies. What happens to maize and wheat and rice and cattle and goats and sheep and trees and water, for example, will foretell what happens to the 1 billion people living in severe poverty today. This snapshot summarizes the state of knowledge on 21 CGIAR crop commodities as well as on the ‘living’ livestock assets of the poor and the water and tree resources on which they depend. The study, Impacts of climate change on the agricultural and aquatic systems and natural resources within the CGIAR’s mandate, should help decision-makers at all levels prepare better for future food production on our warming planet. The summaries, written by scientists at 14 of the 15 CGIAR centres, outline the importance of each commodity for food and nutrition security, its biological vulnerability to climate change, and the likely socio-economic vulnerability of the people affected. The study shows points up some surprising gaps in our knowledge. For example, crops like cassava and yam, which make critically important contributions to the food security of millions of people and are highly climate-resilient, have been little studied in relation to a changing climate. We also know little about how multiple stressors of animals and plants may combine. We also have big knowledge gaps about likely impacts of climate change on weed, pest and disease complexes. We need this information to help identify and evaluate the trade-offs and synergies of particular climate change adaptation and mitigation options in different places. A few things are already for certain. We must develop hardier varieties of maize, rice and wheat—the three main food staples around the world—quickly to avoid declines in their yields. And the common sources of protein—livestock, fish, and even soybeans—all face difficulties in adapting to the new normal. Crops and animals till now neglected by major research initiatives, and now considered ‘old-fashioned’ by many, are likely to play an increasingly important role on global food production once again. Drought-resistant camels and goats, ‘famine foods’ such as heat-tolerant cassava and millet, and dual-purpose crops such as protein-rich cowpea (aka black-eyed peas) and groundnut that feed people and animals alike are all likely to come back to the fore in regions with drying or more unpredictable climates. In some drying regions, smallholders will be forced to switch from crop growing to livestock raising, and/or from raising dairy cows to raising dairy or other goats. This matters to many. As the new CCAFS policy brief reports: ‘In South Asia and sub-Saharan Africa, for example, nearly one billion people living on less than two dollars per day keep livestock; two-thirds of those are women. Fisheries and aquaculture support an additional half-billion people around the world. There is no easy answer for adapting these sectors to changing climates. While the news seems grim, adaptation is possible. Recent CCAFS research in Africa found that farmers are already adapting to climate change. Some 34% of the farmers interviewed in Africa, for example, have reduced their livestock herd sizes and 48% are managing their feed resources better. The better livestock diets also lower livestock methane emissions per kilogram of milk or meat produced. On the other hand, only 25% of the farmers interviewed have begun using manure or compost to improve their soils and only 10% have begun to manage or store agricultural water. For more information, visits the CCAFS blog page on Recalibrating food production in a changing climate—What do we know and what can be done? Read a new policy brief by CCAFS that outlines the challenges required in feeding the estimated 9–10 billion people who will live in this world by 2050. In the brief, the need for a complete recalibration of what crops we grow and animals we raise around the world is detailed, as climate change will bring challenges in weather, water use, and increased pests and diseases of crops and animals alike. The policy brief is based on a new CCAFS working paper. Read the paper by Philip Thornton and Laura Cramer (eds.). 2012. Impacts of climate change on the agricultural and aquatic systems and natural resources within the CGIAR’s mandate. CCAFS Working Paper 23. Copenhagen, Denmark: CGIAR Research Program on Climate Change, Agriculture and Food Security. This report was co-edited by ILRI scientist Phil Thornton, who is a scientist at the International Livestock Research Institute (ILRI) who also coordinates one of CCAFS’ research groups. CCAFS is a global partnership launched in 2011 between the research centres of CGIAR and the Earth System Science Partnership. CCAFS facilitates and integrates thematic work across multiple CGIAR Centres and other global, regional and local partners. Its key target groups are resource-poor agricultural producers, and rural and urban consumers of food, in low-income and middle-income countries in the tropics and sub-tropics. The Guardian’s Global Development Blog: When the chips are down: potato, maize and rice crop yields set to fall—Farmers in developing world will have to grow different food to prevent world going hungry in changing climate, says report, 31 Oct 2012. BBC: Bananas could replace potatoes in warming world, 31 Oct 2012. 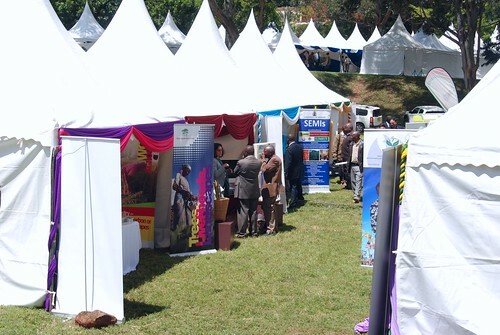 A few of the tents on the exhibit grounds at the 13th Biennial Scientific Conference held at KARI in Nairobi from 22–26 Oct 2012 (photo by ILRI/Alexandra Jorge). 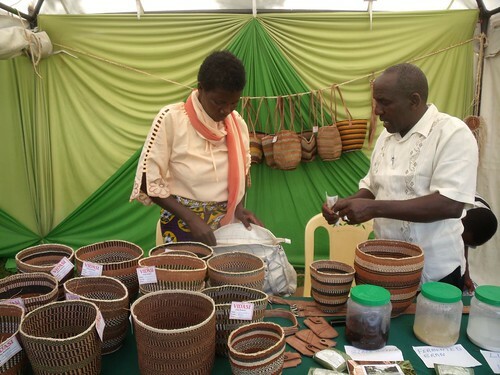 The 13th Biennial Scientific Conference and Exhibition at the Kenya Agricultural Research Institute (KARI) took place last week at KARI’s headquarters in Nairobi’s leafy suburb of Loresho. This correspondent—enamoured of the sea of white tents erected across KARI’s rolling green lawns to showcase hundreds of exhibitors of ‘Agricultural Products, Technologies & Innovations’—never actually made it to the proceedings of the conference itself. But if the conference was anything like the exhibits, it must have been a great success. My organization, the International Livestock Research Institute (ILRI), tried to distinguish its exhibit on livestock forage research and capacity building from the hundreds of other tents just like it with decorations of African artefacts—wooden bowls, woven baskets and traditional cloths and the like—as well as safari chairs inviting passersby to come inside for a conversation. So successful were we that many people upon entering the ILRI tent promptly asked to buy some of the display items (and were promptly disappointed when we told them they weren’t for sale.) The big cattle and camel bells were also a big hit, with the visitors having to explain to ILRI staff the difference between the bell sounds appropriate for cows and those for bulls! We were at KARI to promote opportunities for young Kenyan scientists to train at ILRI, the headquarters of which are located just a 15-minute drive from KARI. And we showcased our collaborative research with KARI scientists, including Solomon Mwendia, on disease-resistant varieties of Napier grass, aka ‘elephant grass’, on which so many Kenyan smallholder farmers depend for feeding their milk cows. Forage seed display at the ILRI booth (photo by ILRI/Alexandra Jorge). 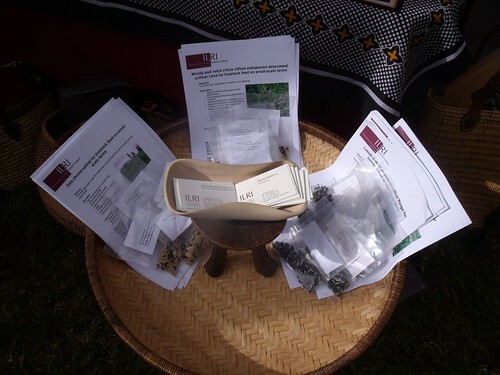 Visitors showed great interest in ILRI printed materials about improved forages and feeds (lab lab, oats, vetch), seed samples and Napier grass cuttings and leaves, and a research-based feed assessment tool for selecting appropriate feeds for different regions. 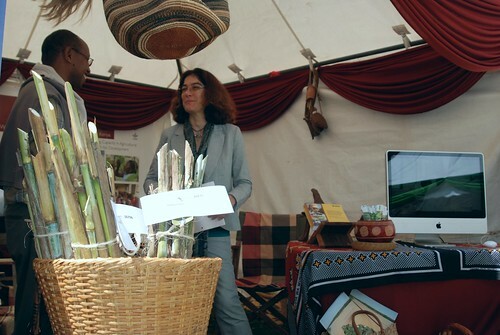 Alexandra Jorge, head of ILRI’s Forage Genebank, in Addis Abba, Ethiopia, talks to a visitor in ILRI’s booth on the exhibit grounds at the week-long KARI scientific conference; in the basket are varieties of disease-resistant Napier from the genebank (photo by ILRI/Paul Karaimu). 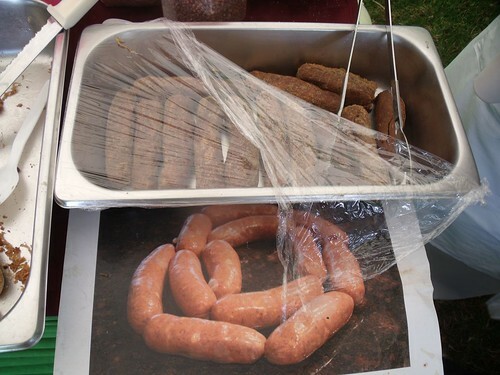 Sausages for sale at the KARI event (photo by ILRI/Alexandra Jorge). KARI display of range grass seed at KARI event (photo by ILRI/Alexandra Jorge). Traditional Taita woven baskets for sale at the KARI event (photo by ILRI/Alexandra Jorge). Finally, Gitau remarked on the close connections KARI has to its constituency. ‘Those of us manning the ILRI booth often directed visitors to the many KARI booths to get their specific farming and livestock keeping questions answered. These people sought practical help and region-specific recommendations we didn’t have’, Gitau said. ‘When I asked people if they knew where to find KARI, I several times got the reply, ‘Hao ni watu wetu’, colloquial Swahili for, “Those are our people”. 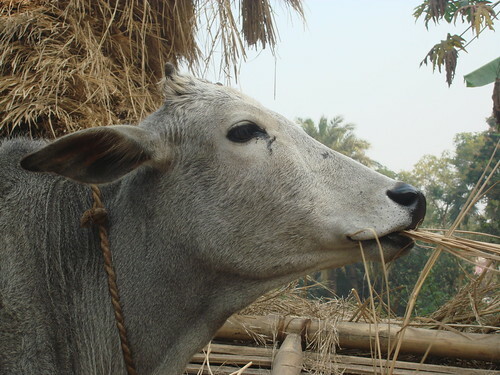 A West Bengal cow consumes straw (photo credit: ILRI/Susan MacMillan). Key findings were presented today on ways to enhance the value of coarse crop ‘wastes’—better termed ‘residues’—as feed for cattle, water buffalo, sheep, goats and other ruminant farm animals. The talk was given at a ‘learning event’ that is part of Agriculture Day at the Rio-20 United Nations Conference on Sustainable Development. Carlos Seré, former director general of the International Livestock Research Institute (ILRI) now serving as chief strategist for the International Fund for Agricultural Development (IFAD), delivered this presentation on behalf of Michael Blümmel, an animal nutritionist based in ILRI’s office in Hyderabad, India, who could not make the event as scheduled. The gist of the presentation is that wheat and rice straw, maize stover, groundnut haulms and other residues of crops that remain after their grain or pods have been harvested for human consumption are major feed resources for livestock in developing countries. Widespread and increasing shortages of arable land and water in these countries are increasing the importance of these crop residues for livestock feed, and their importance will only increase over the coming decades as human population grows and as more and more people move out of poverty and begin adding more milk and meat to their diets. In recent years, livestock and crop improvement researchers have worked together to improve the fodder value, in terms of both quantity and quality, of crop residues at their source. They’ve done this in crop improvement programs that incorporate fodder traits in crop selection, breeding and new cultivar release criteria. Key cereals and legumes are tackled and both conventional and molecular breeding techniques are employed. Fodder traders and feed processors have started employing additional interventions to further improve the superior crop straws and stover. The following examples illustrate the many promising findings from this collaborative fodder research. 01 Nutritionally significant variations exist in crop residue fodder value among existing cultivars that can be exploited through simple phenotyping without detriment to primary crop traits such as grain and pod yields. As a ballpark figure, 5 percentage units in digestibility can be exploited in crop residue fodder quality without detriment to gain or pod yield in all key cereal and leguminous crops. The advantage of daily milk yield accruing from 5% difference in digestibility of basal diet in well designed ration is about 5 kg per day due to a multiplicator effect from both higher energy concentration in the diet and higher intake. 02 Simple and network-sharable food/feed/fodder nutritional phenotyping techniques have been established, such as near-infrared spectroscopy (NIRS) platforms that support whole-plant crop improvement paradigms and programs. ILRI NIRS platforms in India and Ethiopia are being used by other research programs (e.g., the new CGIAR Research Program on Livestock and Fish) and research organizations (e.g., the International Center from Tropical Agriculture and the International Centre for Agricultural Research in the Dry Areas). Staff of national agricultural research institutions from the Congo, Eritrea, Ethiopia, Rwanda, Tanzania and Uganda have been trained in the NIRS technology and have access to network-shared NIRS equations. NIRS is increasingly being used to test for more qualitative grain traits such as lysine, tryptophan, iron, zinc and polyunsaturated fatty acids, with the aim of optimizing whole plants. This collaborative research is facilitating the analysis of 50 to 100 cultivars every day and gaining information about all their pertinent grain and crop residue traits. 03 Fodder value can be further increased through conventional crop breeding (such as recurrent selection) and molecular crop breeding (such as quantitative trait loci [QTL] identification and backcrossing). Identification of stay-green QTLs and their backcrossing into elite sorghum varieties could increase stover digestibility by 3 to 5 percentage units while also increasing the sorghum plant’s drought resistance and water-use efficiencies. 04 In mixed crop-and-livestock agricultural production systems, the rates of adoption of new crop cultivars improved for both food and feed/fodder traits appear to be better than that for adoption of new cultivars improved for food traits only. 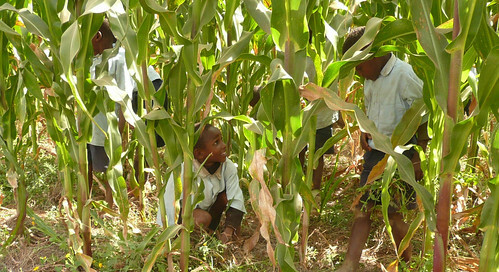 In a recent maize project in East Africa, farmers ranked stover traits 2.4 and grain yield 2.9 on a scale of 3. Farmers were most likely to adopt new maize cultivars that had improved stover as well as grain traits. Anecdotal evidence from groundnut adoption studies in India suggests that farmers prefer relatively small additive advantages—say 10% more pod + 10% more haulm + 10% more haulm quality—over (often theoretical) drastic increases in pod yield. 05 Participants in fodder value chains for straw and stover profit from superior straw and stover. Price premiums for 3 to 5 percentage units in digestibility are in the range of 10 to 30%. There is higher demand for higher quality crop residues and superior sorghum stover is now regularly transported more than 400 km in parts of India. There are significant employment opportunities in harvesting, chopping, transporting and selling these crop residues. 06 Further improvement of superior straw and stover, in the form of supplementation, fortification or densification, can be done in feed processing, with productivity levels achieved from such processed but largely by-product-based feeds being four or more times greater than current levels of production. Complete rations based on more than on 80% by-products (50–60% straws and stovers) can support 15–16 kg of milk daily in dairy buffaloes, about 1 kg live-weight gain in cattle and 120–130 g in sheep. 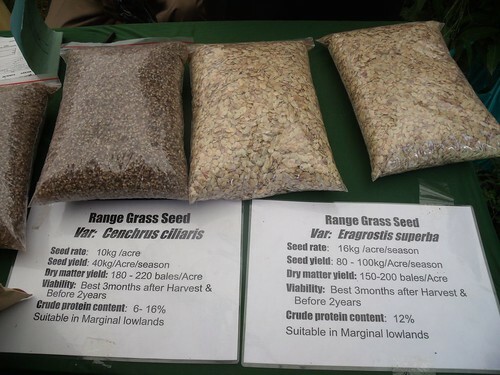 Complete rations are suitable for smallholder farmers because the rations need not entail complex feed processing options; simply chopping and supplementing residues can suffice. 07 Increasing current yields of animals in India, such as by doubling the average daily yield of 3.6 kg of milk (across buffalo, crossbred and local cattle herds), would reduce levels of greenhouse gases dramatically, decreasing methane emission from dairy production by more than 1 million tons per year. This is straightforward; increasing average daily milk yields in India from 3.6 to 6 to 7 kg per animal per day would reduce methane production from dairy animals relative to the same amount of milk produced by about 1 million tons per year. In addition, there are good prospects for mainstreaming such multi-dimensional crop improvement outputs. For example, new CGIAR Research Programs (such as those on maize, rice, dryland cereals, and grain legumes) have already adopted the approach and have incorporated fodder value as high-priority traits in these crops. The Road Back to Rio: ‘LivestockPLUS Learning Event’ shows how better feed reduces poverty AND livestock ‘hoofprints’, 18 Jun 2012. Follow the presentations and discussions of this learning event on Twitter as @agricultureday and check updates via the Twitter-tags #RioPlus20 and #Rio4Ag and the Facebook page for ARDD. You can also follow CGIAR at Rio on this landing page on the CGIAR Consortium website. 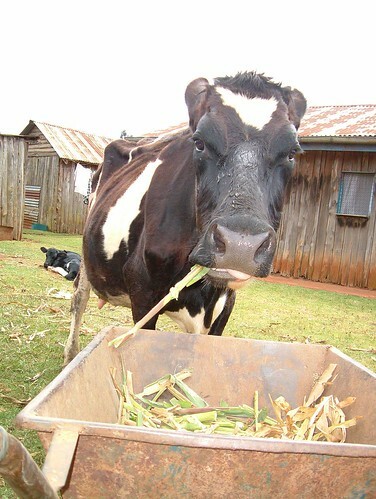 Dual-purpose groundnut, pigeonpea, millet and sorghum raise milk yields in dairy-intensive India, 8 Apr 2012. Food-feed crops research: A synthesis, 17 Jan 2011. 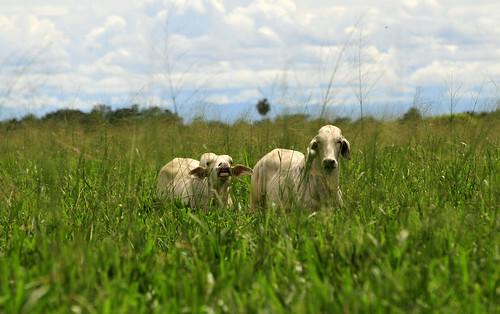 Cattle graze on Colombia's eastern plains, or Llanos (photo on Flickr by CIAT/Neil Palmer). Several hundred people in Rio de Janeiro today will be discussing and debating a topic not often included in high-profile meetings. The topic is how we can use improved livestock feed to reduce both poverty and climate change. The discussions today will take place at one of 13 ‘learning events’ that are part of an Agriculture and Rural Development Day at the Rio+20 United Nations Conference on Sustainable Development. Staff from CGIAR Centres are helping to organize and are participating in events throughout this day. Given that the key messages of this particular learning event run counter to much current thinking about livestock, the participants will share and discuss scientific evidence that demonstrates the benefits of improved feeding practices, particularly their potential for contributing significantly to climate change mitigation while improving livestock production. On the table today are both fodders, coarse foods composed of entire plants or the leaves and stalks of cereal crops, and bulky grass or hay forages. The learning event, titled ‘LivestockPlus—How can sustainable intensification of livestock production through improved feeding practices help realize both livelihood as well as environmental benefits?’, will deliver the following three fundamental messages. New livestock feeding practices, like the use of improved dual-purpose crops and high-quality forages, offer significant potential for sustainable intensification of agricultural production to enhance livelihoods while also reducing livestock’s ecological ‘hoofprint’. Improved tropical forages offer the further advantage of sequestering large amounts of carbon—on a scale similar to that of forests—with the possibility of reducing emissions of nitrous oxide and methane per unit of livestock product. There is evidence that the potential of sown forages to sequester carbon (assuming good pasture and livestock management) is second only to that of forests and that sown forages could realize 60–80% of agriculture’s total potential to mitigate climate change. If widely applied by the vast army of ‘mixed’ smallholder farmers, who raise livestock as well as grow crops, and who are the mainstay of global food security, improved livestock feeding practices could deliver huge increases in food production at reduced environmental cost against a background of rising livestock production and consumption in the developing world. The result of numerous global initiatives and extensive testing, this work offers practical examples of how improved feeds can raise the production and incomes of smallholder farmers. 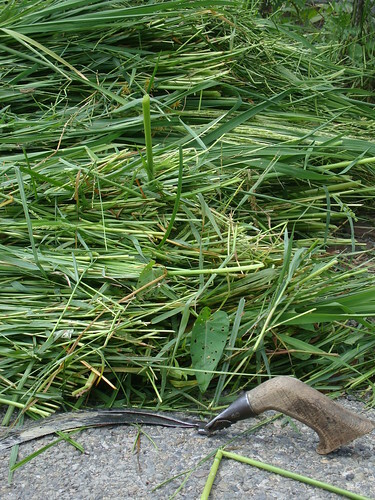 Superior forage grasses widely adopted in Latin America, for example, already generate up to USD4 billion in Brazil alone. And improved tropical forages have also been adopted widely in Southeast Asia since the start of their promotion in 1995. A recent review indicates that continued adoption of improved feeds, including sown forages, could significantly reduce greenhouse gases on a global scale, while enhancing the livelihoods of the one billion people dependent on livestock-cropping systems. 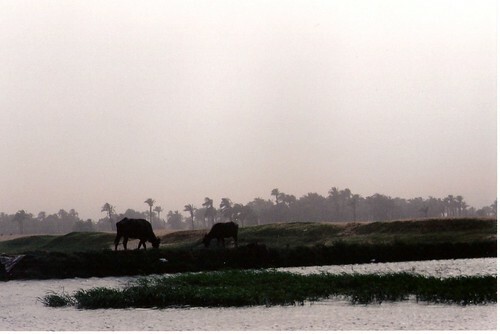 To scale up these improved feed resources so that they contribute to a transformed food system, we need more precsie understanding of the impacts of livestock on climate change, with the impacts differentiated by specific livestock-cropping systems, as well as of the potential for improved feeding practices to mitigate climate change. To make livestock and crop production in the tropics more climate friendly through improved feeding practices, smallholders must be given stronger incentives to market their livestock products and to sequester carbon through improved land management. Smallholders might be encouraged to adopt sown (and carbon-storing) forages, for example, through schemes instituted to pay them for the environmental services they provide. With donor support for research to obtain conclusive data and to provide policymakers with support for their decision-making, a functional system for implementing the LivestockPlus concept and associated strategies could be available within the next 5–6 years. The program for this learning event includes a keynote presentation on the role of forages and livestock production in mitigating greenhouse gas emissions by CIAT soil scientist and agroecologist Aracely Castro; this keynote will be followed by three short case-study introductions on the following topics. Carbon sequestration in livestock production for climate change mitigation: Implications for policy development in Brazil, presented by Embrapa beef cattle researcher Davi José Bungenstab. Livestock production and climate change in sub-Saharan Africa and Asia: Technical innovation for environmental and livelihood benefits, presented by Carlos Seré, former director general of ILRI and now chief strategist for IFAD (note: Seré is speaking on behalf of ILRI animal nutritionist Michael Blümmel). Climate-smart silvopastoral systems for a green livestock economy, presented by CATIE director Muhammad Ibrahim. What are the main research findings that support the technological or policy innovation, including evidence of livelihood and environmental benefits? What were key lessons learned from the research leading to this innovation? What are the requirements for scaling it up? The session will close with a moderated panel discussion in plenary with the keynote speaker and case study presenters. CATIE is a regional centre of excellence based in Costa Rica that works on solutions for the environment and development in rural communities in Latin America and the Caribbean. CIAT, the International Center for Tropical Agriculture, based in Colombia, works to increase the eco-efficiency of agriculture to reduce hunger and poverty and to improve human health in the tropics. EMBRAPA is the Brazilian Agricultural Research Corporation, which works for the sustainable development of Brazilian agribusiness. ILRI, the International Livestock Research Institute, based in Africa, works to reduce hunger, poverty, ill health and environmental degradation through enhanced livestock systems for poor people in the developing world. This learning event will be chaired by Elcio Guimarães, who is director of research for Latin America and the Caribbean at the International Center for Tropical Agriculture (CIAT). Discussions at the session will be summarized by Nathan Russell, a key organizer of this session who leads corporate communications work at CIAT. 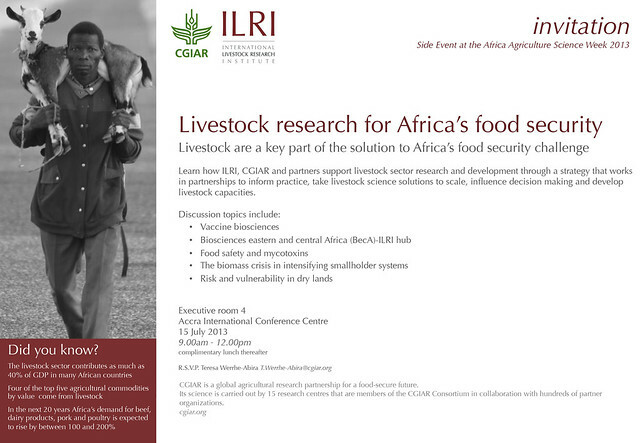 One of the three scheduled case study speakers, Michael Blümmel of ILRI, is unable to attend; his presentation will be made by Carlos Seré, former director general of ILRI and now chief strategist for the International Fund for Agricultural Development (IFAD). Today, 18 Jun 2012, proceedings of the Agriculture and Rural Development Day will be webcast live (the event takes place from 11.30–13.00 Rio time), and you can ask questions and interact with the organizers via Twitter and Facebook. You can also follow the presentations and discussions of this learning event on Twitter as @agricultureday and check updates via the Twitter-tags #RioPlus20 and #Rio4Ag and the Facebook page for ARDD. You can also follow CGIAR at Rio on this landing page on the CGIAR Consortium website. This very brief photofilm (1:23 minutes) shares the memorable and powerful story of Gebremichael Desta, an Ethiopian farmer whose life has changed by the use of improved livestock feed. If you climb up the rickety ladder on to the roof of the stone dwelling where Gebremichael Desta lives with his family and livestock—he keeps his hay on the roof—you can gaze across a world which looks much as it must have done many centuries ago. Ploughmen shout encouragement to their oxen, women urge pack animals over the stony ground and buzzards wheel above the terraced fields. There is not a machine in sight; nothing to indicate that this is the 21st century. But appearances can deceive. ‘The difference between the past and present?’ muses Desta. ‘It’s like the distance between the sky and the earth.’ Today, the families living in these remote highlands—much of Tigray, in northern Ethiopia, is over 2000 metres above sea level—learn about the importance of family planning and good nutrition. Older generations never did. ‘When I was young, we were entirely dependent on traditional medicines if we fell sick, but now we have access to modern health care,’ says Desta. Recent years have also witnessed dramatic changes in the way he and his neighbours manage their land and livestock. A few years ago, at this time of day, his animals—two oxen, a dairy cow and calf, a donkey, 10 sheep—would have been grazing in the valley below, watched over by one of his five children. Now they remain at the homestead, and the fodder is brought to them, rather than the other way around. These changes have been inspired by a five-year project, Improving Productivity and Market Success of Ethiopian Farmers or IPMS, in short, which is funded by the Canadian International Development Agency and managed by the International Livestock Research Institute (ILRI) on behalf of the Ministry of Agriculture and Rural Development. In 10 districts across Ethiopia, the project has helped to improve the value chains—the links between producers, the suppliers of farm inputs and markets—for a range of crops and livestock products. The project began with a lengthy series of consultations with farmers and local government staff. Together, they identified which farm commodities had the potential to improve local incomes and livelihoods. ‘The main candidates were milk and butter, sheep for fattening and beekeeping,’ recalls Gebremedhin Woldewahid, the project’s research and development officer in Atsbi-Wenberta District. ‘But the more we talked, the more we realised there was a major limiting factor for all these commodities—a lack of nutritious fodder.’ Much of the district suffered from overgrazing and heavily degraded soils. Tackling this was to be a priority. ‘In 2006, before the project really got under way, this valley would have been parched and dusty and full of livestock at this time of year,’ explains Kidan Kindeya, a young woman who works as a development agent for Habes Peasant Association, of which Desta is vice-chairman. Today, there is not a grazing animal in sight and the vegetation is green and lush. Here and there, the grass has been harvested with a scythe; elsewhere it is almost knee-high, despite the fact that there has been little rain recently. There are numerous benefits to the ‘cut and carry’ system now operating in many valleys in Atsbi-Wenberta District. ‘My milk yields have risen and my animals are much healthier,’ says Desta. He also believes that by keeping animals at the homesteads, there is less risk of infectious diseases passing from one to another. The restoration of grazing lands has also led to an increase in flowers, providing a rich supply of pollen for honey bees. As a result, farmers practicing apiculture have benefited greatly from the new methods of pasture management. In the past, children used to watch over the grazing livestock, which meant they did not go to school. Now they are attending classes. Farmers also used to spend a lot of time travelling long distances to buy fresh grass and hay. Now many have a surplus. This has proved especially important for the poorer households without livestock, which are often headed by widows. ‘They received no benefit in the past from areas like this, before the enclosures,’ explains Kidan Kindeya. ‘They had no livestock to graze, and there was nothing for them to harvest.’ Now, every family is allocated the same amount of land in the valley and those without livestock can harvest their grass and sell it. 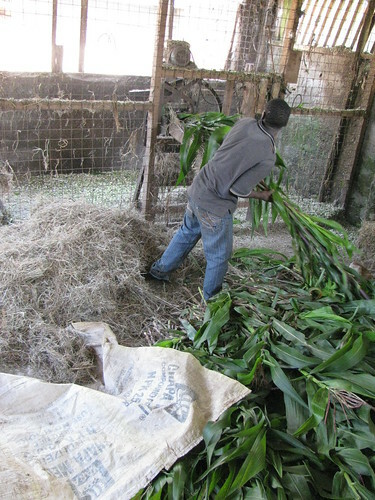 Two harvests a year yield fodder worth around 10,000 Ethiopian birr (USD740) per hectare. Besides helping farmers to improve the supply of natural fodder, the local offices of the Ministry of Agriculture and Rural Development and the peasant associations have encouraged farmers to grow their own supplies. Training centres, many with colourful murals depicting the new ways of farming, have provided the know-how and materials to establish Napier grass, tree lucerne and other fodder crops. Now you see them growing around almost every homestead, besides plots of fruit and vegetables. ‘When I was young,’ says an old priest outside the Orthodox church in Cherkos Haremere, ‘there was thick forest all over this hillside.’ All that remains is a fine stand of African olive trees around the church, the site’s sanctity protecting them from axe and fire. Over the years, a rapidly rising population and the ever-increasing demand for fuelwood, cropland and pasture transformed the rest of the landscape, much of which suffers from erosion and overgrazing. It is a scene repeated across the district, but gradually, thanks to the efforts of the peasant associations and the introduction of new management techniques, degraded land is being brought back to life. 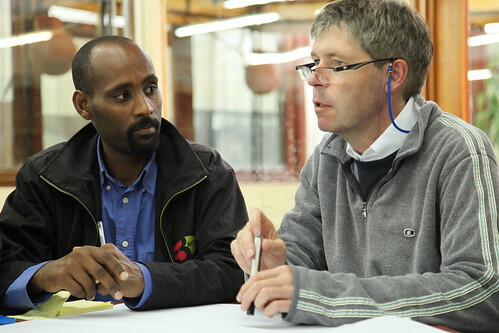 Much of the technical advice that has enabled farmers to improve their productivity and gain access to better markets has been provided by Gebremedhin Woldewahid and the IPMS project, but most of the training has been carried out by the local offices of the Ministry of Agriculture Rural Development and by development agents like Kidan Kindeya. ‘That means that when the project comes to an end, hardly anybody will notice we’ve left,’ says Woldewahid with satisfaction. When asked what he has gained in recent years, Gebremichael Desta responds with one word: knowledge. He still regrets that he left school at the age of 17. He was a bright child, but his parents, traditional peasant farmers, had little appreciation of the value of education. Desta is justly proud that his eldest son has a diploma in agriculture and now works as a development agent, and his eldest daughter is studying at university. 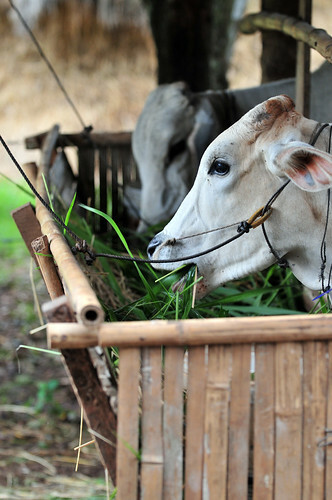 A cow feeds on improved CIAT forage grasses, in Kampong Cham, Cambodia (photo credit: Neil Palmer/CIAT). Last week, coming on the heels of a Planet Under Pressure conference in London, which set out to better define our ‘planetary boundaries’ and to offer scientific inputs to the Rio+20 United Nations sustainable development conference this June, a group of leaders in Asia—comprising agriculture and meteorology chiefs, climate negotiators and specialists, and heads of development agencies—met to hammer out a consensus on ways to make Asian agriculture smarter. The workshop, Climate-smart agriculture in Asia: Research and development priorities, was held 11–12 April 2012 in Bangkok. It was organized by the Asia-Pacific Association of Agricultural Research Institutes; the CGIAR Research Program on Climate Change, Agriculture and Food Security; and the World Meteorological Organization. This group set itself three ambitious tasks: To determine the best options (1) for producing food that will generate lower levels of greenhouse gases, which cause global warming; (2) for producing much greater amounts of food, which are needed to feed the region’s rapidly growing and urbanizing population; and (3) for doing all this under a changing climate that, if farming and farm policies don’t change, is expected to reduce agricultural productivity in the region by anywhere from 10 to 50 per cent over the next three decades. The workshop participants started by reviewing the best practices and technologies now available for making agriculture ‘climate smart’. They then reviewed current understanding of how climate change is likely to impact Asian agriculture. They then agreed on what are the gaps in the solutions now available and which kinds of research and development should be given highest priority to fill those gaps. Finally, they developed a plan for filling the gaps and linking scientific knowledge with policy actions at all levels. On the second of this two-day workshop, the participants were asked to short-list no more than ten key areas as being of highest priority for Asia’s research and development communities. This exercise tempted this blogger to suggest ten suitable areas in the livestock sector. (1) Lower greenhouse gas emissions from livestock through adoption of improved feed supplements (crops residues) that reduce greenhouse gas emissions. (2) Safeguard public health by enhancing Asia’s capacity to detect and control outbreaks of infectious diseases transmitted between animals and people. (3) Improve the efficiency of water used for livestock and forage production. (4) Pay livestock keepers for their provision of environmental services. (5) Recommend levels of consumption of meat, milk and eggs appropriate for the health of people, their livelihoods and environments in different regions and communities. (6) Design institutional and market mechanisms that support the poorer livestock keepers, women in particular. 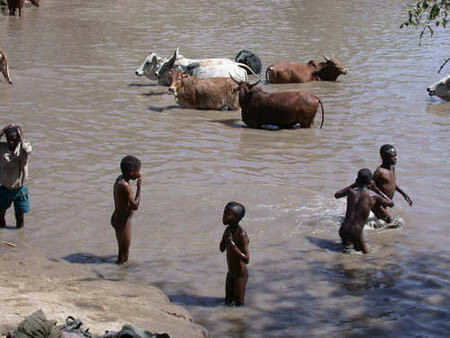 (7) Educate publics in the West on the markedly different roles that livestock play in different regions of the world. (8) Adopt risk- rather than rule-based approaches to ensuring the safety of livestock foods. (9) Focus attention on small-scale, relatively extensive, mixed crop-and-livestock production systems. 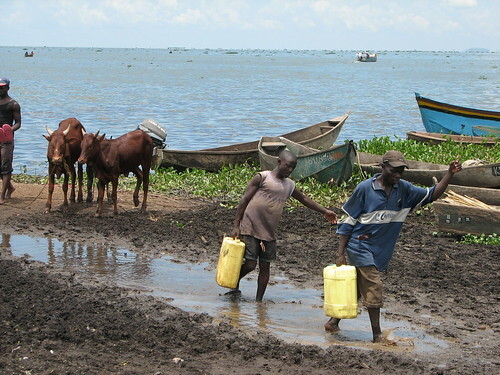 (10) Give livestock-keeping communities relevant and timely climate and other information via mobile technologies. Do you have a ‘top-ten’ list of what could make Asian agriculture ‘smart agriculture’? Post it in the Comment box, please! Go here for ILRI blogs about the Planet Under Pressure conference.